It isn't for someone sitting amidst the packing crates of their first espresso machine looking for quick tips (the Espresso Mini-FAQ may serve that purpose). However, if you've discovered your love for espresso and realize no quick guide will get you to the perfect shot, you've found the right place. This is an introduction to espresso by an enthusiast for the budding enthusiast. It is not just about techniques and equipment, but also the reasons behind them. The knowledge and skills for great espresso are out there waiting for you, and thanks to the Internet they've gotten easier to find. But to an outsider, the discussion on web sites can seem like babble. Espresso equipment and preparation are argued over in minute detail, often with no indication of the topic's importance. And the taste of espresso is lauded or condemned with hyperbole worthy of a poet or wine critic. But the seeming loons posting this stuff are making some of the best espresso on the planet. Understanding what they're talking about and being able to use their ideas in your own espresso making is the best way to improve. This guide is long and sometimes opinionated. I don't apologize for either. It conveys the basic knowledge of the espresso community, as well as some of its arguments and hot button topics. More importantly, it teaches you the language we're speaking and lets you join in. The guide's main topic is making real espresso and espresso drinks at home. 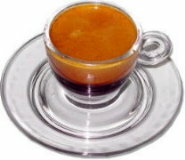 The sad fact is, outside of Italy and the other Latin espresso-making countries, few people have had real espresso. Most cafés sell overpriced hot milk with coffee flavoring, and the majority of the mass market home espresso machines are designed to produce the same. For such drinks, espresso quality is irrelevant. There have always been a few great cafés outside the espresso countries, and thanks to the growing number of enthusiasts, their number is growing too. But even large cities are lucky if they have more than one or two. So for most of us who insist on good espresso, the only option is to make it ourselves. Unfortunately, good espresso is not easy to make—it takes practice. Mass produced home espresso machines are unequal to the task. A minimal set-up capable of excellent shots will cost around US$500, and those capable of delivering consistency and a degree of ease cost $1000 and up. All I can say is that the taste is worth it. There is an added bonus. The world of coffee is fascinating and the people in it are wonderful. Becoming good at making espresso means getting to know and appreciate that world and its people. And that is just as rewarding as the taste of great coffee. The guide is divided into this introduction and four content pages. It begins with a short history of espresso and an overview of the contemporary scene. Next the guide turns to the first three of the "four Ms" of espresso: Miscela (coffee blend), Macinacaffe (grinder) and Macchina (espresso machine). Skills of the barista, Mano, are then covered in considerable detail, including instructions for making cappuccinos and lattes. Lastly, the guide offers a selected set of links that will get you started on the coffee Internet. If you're an old hand on the coffee Internet, much in this guide will be familiar. But the list of tips in the shot diagnostic section is more comprehensive than any I've run across, and may contain some that are new to you. The history section has my take on where espresso is heading and may be good for some laughs, especially in about five year's time. Finally, a word on the reliability of the information in this guide. The basic facts are accurate to the best of my knowledge. The information on how machine settings and options or shot making variations affect taste is based on the consensus of the espresso community, and has worked in my own practice. However, there are always disagreements, and in some cases, the evidence is meager. In other words, this guide will get you started making excellent espresso, but is far from the final word. Once you have become confident in your technique and taste, I urge you to try out alternatives and judge for yourself.